Learn the little-known secrets to igniting your AMBITION, then start using it to achieve everything you want in life! Think back to your first few months in a new job. Or your first week on a new diet or exercise program. But then, over time, that intense drive of yours slowed a bit. That’s natural, we can’t all be incredibly ambitious all the time. At home, at work, always. That’s a shame, because positive ambition is one of the most powerful success tools you can ever develop. It directs you to your deepest desires, wealth, and success, not through selfish means, but by working with others to achieve mutual goals and promote high-minded principles. 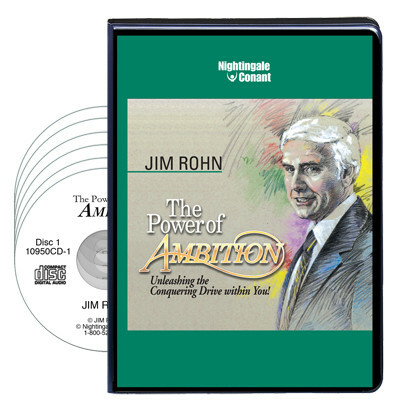 Please send me Jim Rohn’s bestselling 6-CD audio program The Power of Ambition today for just $69.95, which is 50% off the regular retail price. Take advantage of this limited-time special discount now!